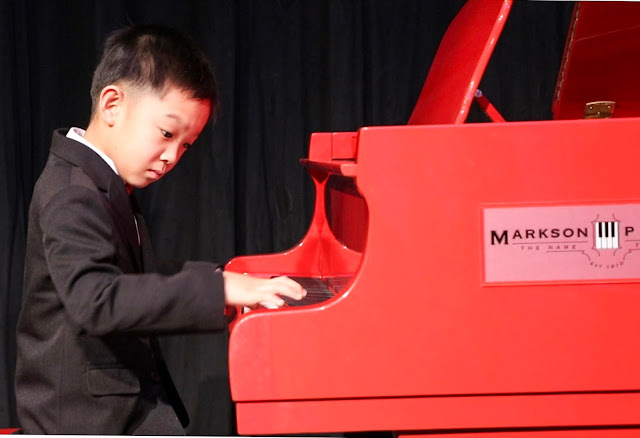 Cary Wang, 9 year-old third grader from New Canaan CT, has been invited to perform in Carnegie Hall nine times and London Royal Albert Hall in last two years. The young pianist began exploring piano at the age of five. Currently he studies with Teacher Felicia Feng Zhang of Greenwich, CT. His dedication to piano and passion for music is remarkable for his young age. Cary loves to play piano and practices every day couple hours even on family vacations, as he often says making music takes him to a different world! He plays with a rare combination of focus, energy and maturity beyond his young age. At the age of 6, Cary was selected as the First Place Winner of American Protégé International Music Talent Competition Fall 2015 and made his debut with Claude Debussy's ""Le Petit Nègre"" at Carnegie Hall December 2015. Since then, he has won the First Place in many state, national and international piano competitions, including 2016/2017 Golden Key International Music Festival, Little Mozart Competition, Great Composer Competition – Masters of Piano Sonata and Best Mozart Performance, American Protégé International Competition of Romantic Music, London Grand Prize Virtuoso International Music Competition at Royal Albert Music Hall of London, Crescendo International Competition, AADGT International Young Musicians Festival “Passion of Music 2017”, American Fine Art Festival, Elite International Music Competition, Golden Key Vienna Music Festival, etc. In June 2016, Cary was honored in the National Piano Guild for his live performance of fourteen Sonatina movements by memory and won special Gold Sonatina Medal plaque with top rating of “Superior Plus” for his perfect scores from the judge. In December 2017, he accomplished Piano Level 8 Assessment or Royal Conservatory Music Development Program with First Honor. March 2017, Cary was invited to join the prestigious Yamaha Artist Mr. Jose Ramon-Mendez and perform at [email protected] Yamaha Piano Concert Series curated by Yamaha Artist Ms. Mirian Conti. Cary also regularly performs as either solo or part of ensemble at senior centers, mall and schools to share the joy of music with everyone! He has also started his learning in Composition and Cello late 2016. On the academic side, Cary has earned High Honor for being among the highest-scoring students in the 2016-717 Johns Hopkins Center for Talented Youth Talent Search He also enjoys math, swimming, chess, golf and tennis. He is on New Canaan YMCA Caimans swim team as one of the youngest swimmers. Cary regularly competes in regional swimming competition as well as chess tournaments.